Lead to a life of genuine freedom and wholeness. I’m all about facing the truth head on. After many years of repressing my past trauma and denying its devastating effects, I realized denial is a treadmill that goes nowhere. Does anyone else out there relate??? When I finally got painfully honest about my true inward condition, I discovered that Jesus’s death, burial and resurrection was more than sufficient to heal, deliver and transform the whole mess! 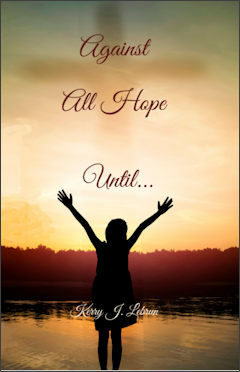 If you feel stuck in what may feel “hopeless” in your life, you will be encouraged and inspired by the prophetic dreams and visions God gave me to unveil the meaning of the Cross and how to apply it’s restoring Power, documented in my book, Against All Hope Until… In my book I share these same revelations that set me free from PTSD and related issues, and teach them from scripture in simple terms. People, this world can be devastating, but I tell you, there is a real Answer! For more info visit heavenshopeunveiled.com. 7 comments on Reality check. Yes and Amen, there is an Answer! The Holy Spirit is taking me through a never ending process in removing the scales of denial from my eyes. Eventually, the reality becomes clearer and clearer that the answer to my boredom, emptiness, pain, and suffering as a result of faulty standards from the world, is in the all sufficient power of the cross, death, burial, and ressurection of Jesus Christ. I thank God, He so loved me that He gave me His only Son Jesus as the answer to my life. He is The Truth, The Way, and The Life. As I continue to walk by faith, my Heavenly Father gently shows me and teaches me with His lovingkindness, how to depend on Him and learn how to live by His standards that’s a whole flipside from the worlds. Learning to live by His loving standards keep me from self-destructive behavior and keeps me growing into the whole and complete human being He created me to be in the image and likeness of His perfect Son Christ Jesus. Thank you Jenelle for your powerful testimony and words of wisdom! I like how you equated denial with blindness….SO TRUE! I’m so excited that you are staying in the Light and allowing God to transform you into the butterfly that you are in Him! Thank you Kerry for boldly sharing what God has revealed to you concerning the finished work of Jesus at the Cross ! I am starting a journey of facing the pain that I so carefully pushed down so deep in me that I sometimes forget it is even there …deep down…. I have known the Lord for a long time but I was always “running “ from my pain. I realize that there will be no true freedom until I face this pain head on. You are an inspiration and an encouragement to me. I can now see the light at the end of the tunnel. Your’e welcome Sonia! I totally relate with you on that. I buried my pain and blocked my memories for over half of my life! Facing it was painful and challenging, but much less so than staying imprisoned for my entire life. Thank you for sharing, my courageous friend, and I will be praying for you! God has great things in store for you! upbringing didn’t really know what to do about that……..
fully free when we see him…. 1/10th of 1% of my journey….that’s how great God is!!!!!!!!!! Wow Paul what a powerful testimony! Thank you for sharing with us! Its yet another proof for those who feel their situation is hopeless, that a life surrendered to Christ, in time, becomes beautiful. Please let us know when your book is written!!! !